Lyle: In the past few lessons you have learned the basic open position major and minor chords. 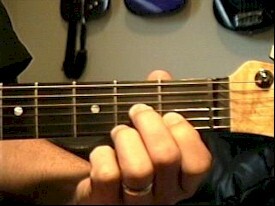 Now it's time to learn the "dominant 7" chords in the open position. 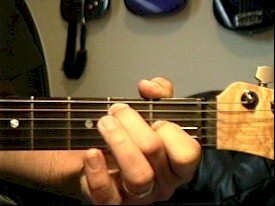 Lyle: The "dominant" chord has a bluesy sound to it compared to the other major and minor type of chords. Lyle: Don't worry if the theory and terminology throws you off, just memorize what you're playing for now. Lyle: Remember to follow the correct pick direction so that you learn to sound smooth and even with these simple picking patterns. Lyle: Remember you can use the looping jam track of the basic drum beat to practice keeping a steady beat with. Lyle: I find it difficult to get the open 4th string to ring clearly. This is an important note because it is the "flatted 7th" degree and the reason why the E7 chord sounds bluesy. 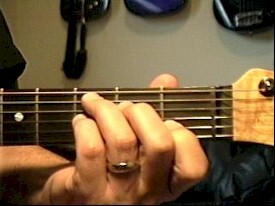 Lyle: Try to get your 2nd finger to roll up on its tip and out of the way of the open 4th string when playing this E7 chord. Lyle: That's your goal for this lesson, to be able to play this blues progression a few times through with the jam track. sammy_andrews: Yes, what scales would you use to play over these dominant chords?? Lyle: Well, there are so many to choose from. 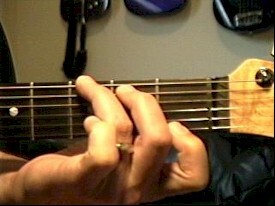 I would use the diminished/whole tone scale also known as the Phrygian Dominant. 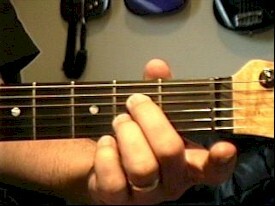 You could use the minor pentatonic for a real bluesy sound or try the Mixolydian mode for a melodic sound. More about scales in the near future....stay tuned! david_reid: what's the difference between Phrygian and Phrygian dominant? Lyle: Scales are a whole 'nother beast to deal with. We must first learn to walk before we can run...grasshopper. Lyle: Let's take a break for now. Thanks everyone for being here live tonight and for your good questions. We'll work on scales soon enough. That's all for this lesson. Have fun, practice hard, and see you at the next lesson!